TRAC makes no representations, express or implied, that the information contained in the Tenant Survival Guide can or will be used or interpreted in any particular way by any government agency or court. As legal advice must be tailored to the specific circumstances of each case, and laws are constantly changing, nothing provided herein should be used as a substitute for the advice of competent counsel. Still facing problems with your landlord? Visit TRAC’s website or call TRAC’s Tenant Infoline at 604-255-0546 or 1-800-665-1185. The Tenant Survival Guide is produced by the Tenant Resource & Advisory Centre, a non-profit organization that promotes the legal protection of residential tenants across BC by providing information, education, support, and research on residential tenancy matters. The Tenant Survival Guide © TRAC Tenant Resource & Advisory Centre is licensed under a Creative Commons Attribution-NonCommercial-ShareAlike 2.5 Canada Licence. This licence lets others share, reuse, remix, and build upon the work non-commercially, as long as they credit the copyright holder and license their new creations under the identical terms. TRAC acknowledges funding from The Law Foundation of BC, Province of British Columbia, and City of Vancouver. The online version of the Tenant Survival Guide is available on Clicklaw Wikibooks at wiki.clicklaw.bc.ca. The online version should be consulted for the most recent information on topics covered by this publication. 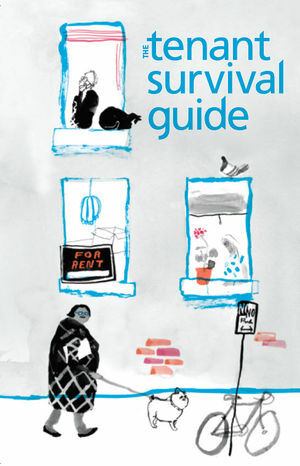 To request a copy of the Tenant Survival Guide, contact Emma Lazo at emma@tenants.bc.ca. TRAC offers a FREE video-based and self-paced online course, Renting it Right, that gives tenants practical and legal information on how to find rental housing and maintain a stable tenancy. Students who register and pass a final exam are provided with a certificate of completion. Check out TRAC’s Facebook Page. Follow TRAC on Twitter at @trac_bc.